New blood vessels branch out of preexisting ones is via a process called angiogenesis. Although this is essential for survival, development and wound healing, on the flip side, it also feeds and progresses malignant tumors, as well as other diseases. IBS scientists at the Center for Vascular Research, within the Institute for Basic Science (IBS), in collaboration with LIM Dae-Sik at KAIST, discovered a key regulator of this process, which could become a potential therapeutic target for treating diseases associated with the formation of new blood vessels. Cells forming the wall of blood vessels, endothelial cells (ECs), are the main actors of angiogenesis. The formation of a new vascular wall is a multistep process that requires coordinated cell migration, proliferation, and junction formation. ECs need to stretch and move and to do that, they use their own "skeleton", the cytoskeleton. The ECs at the front of the migration route are called tip cells and the ones at the base the stalk cells. Tip cells form extensions that help them to creep into the connective tissue. Then, as the new vessel grows out of the existing one, cells also need to create strong bonds to assure a robust wall. Each step is controlled by several proteins whose behavior is only beginning to be understood. 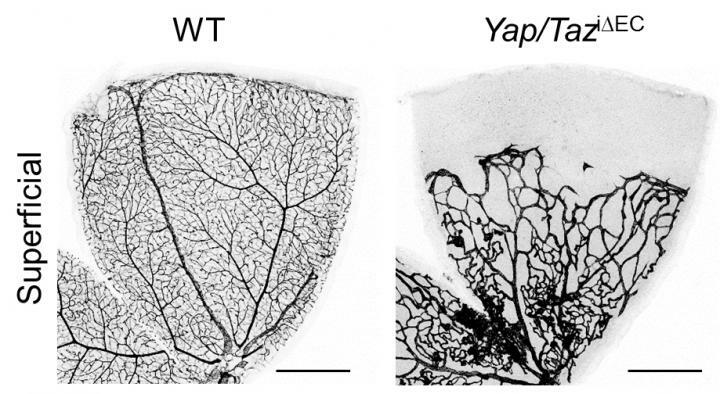 The research team found out that in the presence of growth stimuli, the proteins YAP and TAZ are critical for sprouting angiogenesis, vascular barrier formation, and maturation. YAP and TAZ work together and they have been re-dubbed YAP/TAZ. YAP/TAZ is negatively controlled by the Hippo signaling pathway, a "molecular conversation" whose role is to adjust the organ size to a normal volume. Curiously, mutations in the proteins of this pathway cause oversized organs, from that the name "hippo". Scientists found that if they overexpress YAP/TAZ, ECs form an excessive number of extensions and boost an abnormal growth of blood vessels, similarly to a tumor. On the other hand, removing YAP/TAZ from 2 day old mice leads to poorly vascularized retina, vision impairment, and internal bleeding in several areas of the brain. In the latter, the ECs' tips are blunt. YAP/TAZ promotes cytoskeleton remodeling, as well as distribution and abundance of proteins that cement the junction between ECs. For this reason, YAP/TAZ is essential for the formation of the blood retinal barrier and the blood brain barrier. The former protects the eye from potentially toxic substances present in the blood, and the latter does a similar function to defend the brain. Since angiogenesis is also the root of several diseases, the team tested adult mice that model a common cause of vision loss in the human elderly population, known as age-related macular degeneration. This disease is characterized by a leaky blood retinal barrier and growth of blood vessels under the retina. In this way, they confirmed that YAP/TAZ is also involved in pathological angiogenesis in adulthood. "Understanding angiogenesis at the molecular level can help us to address pathological angiogenesis in age-related macular degeneration and cancer," said KOH Gou Young, corresponding author of the study.